you can also connect via bluetooth to another iDevice, and draw together. It’s great for just simple patterns and messages. 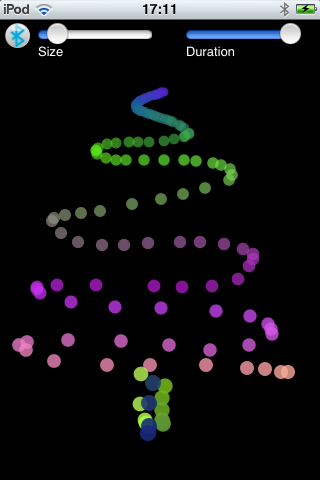 The colour (color if you are in the US) rotates around, and you can change the size of the dots that are drawn, and the length of time for which they stay. It’s not a great complex app, but it’s quite fun to doodle with others on a shared screen. Give it a go, you might like it.